Western Women: "Ankle High And Knee Deep"
Gail Jenner opens our eyes to true country living. The cow is pregnant, and attempting to give birth. But there are complications, and the rancher pulls out tools, including chains, a hammer, and a chisel. 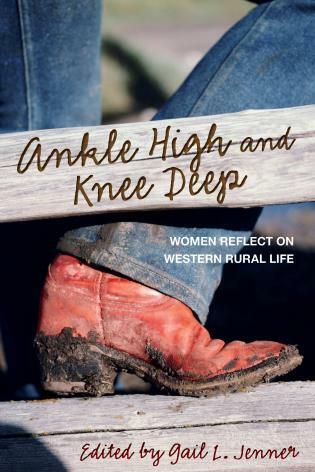 Gail Jenner saw it in her own barn, and tells the story in one of the essays in the book she edited, Ankle High and Knee Deep: Women Reflect on Western Rural Life. The title tells you plenty, and Gail Jenner joins us to tell you about the process of collecting the remarkable women and remarkable stories of the book. Population Up, Farmland Down: "The End Of Plenty"
Joel K. Bourne, Jr. digs into farming and global food issues. The recent news that the Earth's population could hit 11 billion by the end of the century should give anyone pause. Maybe we are capable of feeding all those mouths with current agricultural technology, but what if large chunks of farmland are rendered unusable by climate change? These are the questions Joel K. Bourne, Jr. considers in his book "The End of Plenty: The Race to Feed a Crowded World."